Seen outside Hayles Home & Office Furniture, 630 SE Belmont, Portland OR. Priced at $225. 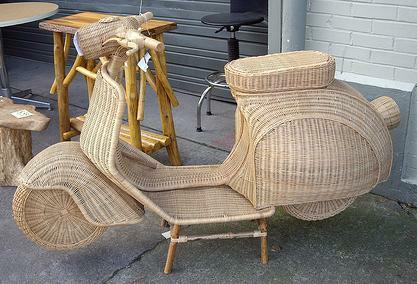 Thanks to Motokitty Cari for pointing out this neat wicker scooter! This entry was posted in Miscellaneous by Cassie. Bookmark the permalink. I’m halfway tempted to put a real scooter inside there. But then again I really hate wicker. This is so bizarre! I’d almost say someone clever could put a rocking device on this and make it a sort of a rocking horse for a scooterist’s kid. But it’s so actual size that if a kid can ride this and not fall off they might as well have the real thing!